Fresh, local, seasonal strawberries start to appear in June. While you can enjoy strawberries all by themselves, using them in desserts is a great way to enjoy them while they are at the peak of their flavor. An array of recipes work well with fresh berries. The best are those that don't require you to bake the strawberries and allow their fresh flavor to shine, like the following recipes. How Do You Make a Strawberry Daiquiri in a Blender? Since fresh local strawberries are at their best at the start of summer, ice cream is a great way to show off these delicious berries. Many people don't have ice cream churns, but don't worry. 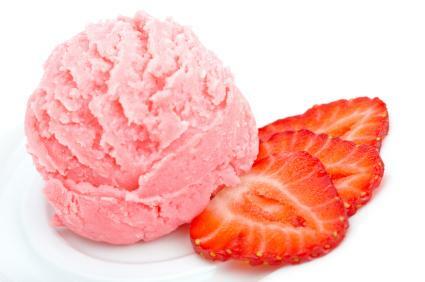 This recipe makes a creamy strawberry ice cream - without churning. Place strawberries in a blender with sugar, lemon juice, and vanilla. Purée until well combined. Add yogurt to blender and pulse several times to combine. In a cold bowl using cold beaters, whip the cream until it forms peaks. Fold the strawberry mixture into the whipped cream. Pour into a tightly sealed freezer-proof container and freeze for six hours or longer. Strawberries pair beautifully with chocolate, and this recipe makes the most of that pairing. Roll out the pie crust and place in a 9 inch pie pan. Make fudgey brownie batter and spread over the pie crust, using a rubber spatula to smooth it. Bake crust and brownies for 20 to 30 minutes, until the brownies are set in the center, but not fully baked. After about 15 minutes of baking, cover edges of crust with foil to prevent over browning. Set aside on a cooling rack. Meanwhile, combine cream cheese, sugar, vanilla, and egg using a mixer, blender, or food processor until smooth. Carefully spread cream cheese mixture over the partially baked brownies. Bake for another 20 minutes until the cream cheese sets. Keep foil over edges of crust to prevent over browning. Cool the pie for at least one hour. Top with sliced strawberries and drizzle with ganache. Parfaits have layers that can make your dessert look spectacular and help hide little extra surprises that your guests might not have expected. Wash and dry the strawberries. Cut the tops off of the strawberries. Place the sliced berries in a bowl and sprinkle with the white sugar. Mix and place in the refrigerator while you make the cream. Using a medium-sized bowl that has been chilled for about 10 minutes in the refrigerator, whisk the cream for three minutes. Add half of the confectioners' sugar and continue whipping for another two minutes. Add the rest of the confectioners' sugar and whip to a medium stiff peak. Place about a quarter cup of sliced strawberries in the bottom of each glass. 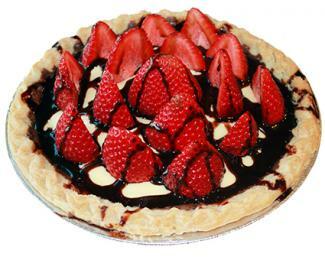 Carefully pour a small amount of chocolate sauce in the center of the strawberries. Add a good dollop of whipped cream over the strawberries, about a quarter cup, but you don't have to measure it. Repeat this process until you reach the top of the glass. 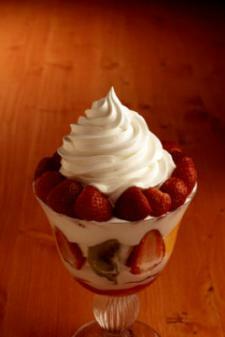 Top with a large dollop of whipped cream and any remaining strawberries. Fresh strawberry pie is always a favorite. Shape pie crust into a 9 inch pie pan and prick the bottom with a fork. Sprinkle the edges of the crust with one tablespoon of sugar. Place pie weights in crust. Bake for 20 to 25 minutes until crust is browned. Remove from oven and allow to cool on a pie rack. In a food processor, process six ounces of fresh strawberries until puréed. In a medium saucepan, whisk together sugar, corn starch, salt, and pectin. Over medium heat, bring mixture to a boil and then boil for two minutes. Remove from heat and stir in lemon juice. Put remaining berries in a bowl. Pour puréed strawberry mixture over the top and stir to combine. Pour into cooled pie crust. Pipe or spoon whipped cream over the top. Refrigerate for two hours before serving and serve within about six hours for best flavor and texture. To truly get the best flavor from your strawberries, the less you do to them, the better. Usually just sprinkling the strawberries with sugar and a bit of cream is all you need, but a quick dip in melted chocolate can be delightful as well. 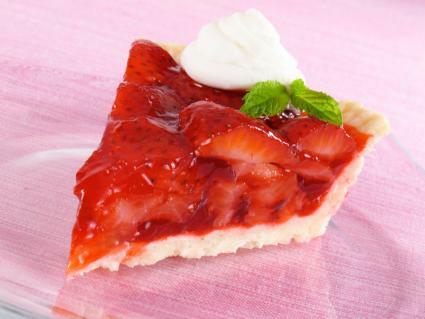 Strawberries also make a terrific topping for light cakes, such as angel food, or frozen desserts. You can use them by themselves or add a little sugar to sweeten them. Fresh strawberries do not last very long, so if you plan on saving them you will have to work fast once you get home. Freezing strawberries is really easy and they can keep for months in the freezer. The only problem with freezing strawberries is they tend to get a bit mushy when they thaw out. To avoid this problem, you can use dry ice to flash freeze them; since most people don't keep dry ice around the house, you may just want to use the berries for pies, sauce, smoothies, or margaritas once thawed. To freeze strawberries, wash and dry them thoroughly, and then place them on a cookie sheet that has been lined with parchment paper. Place the cookie sheet with the strawberries in the freezer and let freeze overnight. Then just store them in a Ziploc bag. Fresh, local strawberries are a treat that only last a short time every spring and summer. Make the most of them by respecting the ingredients. Along with the recipes above, strawberries are delicious left whole, and then dipped in sour cream and a little brown sugar. By using your strawberries in as close to an unaltered state as possible, you can get a true taste of summer.